We bring you last week's top performances from Mexicans who are playing abroad and who all have had prior experience of national team duties at youth or senior level. 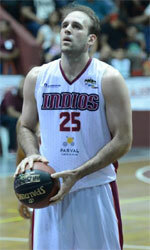 This week's number one is an experienced international center Gustavo Ayon (207-85). Heto an easy victory against the 12th-ranked Blusens Monbus in the Spanish Liga Endesa in Sunday night's game.